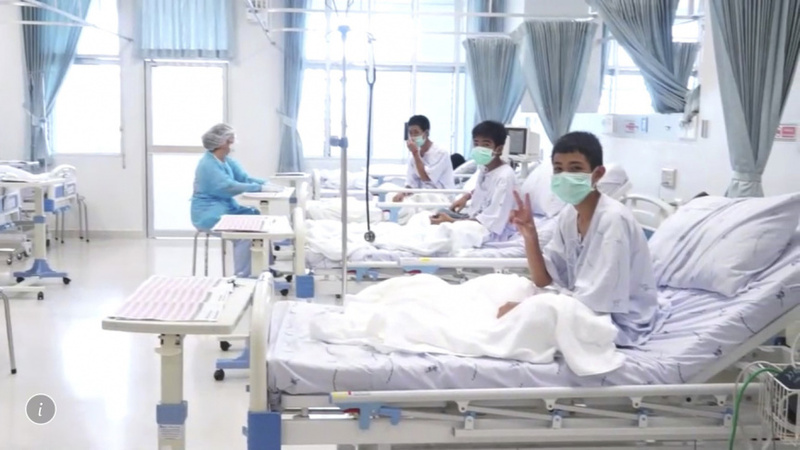 MAE SAI, Thailand (AP) — As ecstatic relatives watched and waved from behind a glass barrier, the 12 boys and their soccer coach rescued from deep within a flooded cave in Thailand made the V-for-Victory sign Wednesday from their beds in a hospital isolation ward where they are recovering from the 18-day ordeal. That gutsy determination was on display Wednesday in a video taken from the hospital isolation ward. The boys, their faces covered by green surgical masks, flashed the V-for-Victory sign as they sat up in bed and chatted with their nurses, at times responding with the customary Thai sign of respect — hands pressed together while bowing the head. The youngest boy, 11, appeared to be asleep under a crisp white sheet. The four boys and 25-year-old soccer coach who were brought out Tuesday on the final day of the three-day rescue effort have recovered more quickly than the boys rescued on Sunday and Monday, Chaiwetch said. The SEALs commander, Rear Adm. Apakorn Youkongkae, said the soccer coach, Ekkapol Chantawong, determined the order the boys from the Wild Boars soccer team should be rescued in. "The coach was the one to choose," he said. The group had entered the sprawling Tham Luang cave in northern Thailand to go exploring after soccer practice on June 23 when monsoon rains filled the tight passageways, blocking their escape. They were found by a pair of British divers nearly 10 days later, huddled on a small, dry shelf just above the water, smiling with relief but visibly skinny. The complex mission for the rescuers from Thailand, the U.S., Britain, Australia and other countries to guide the boys and coach through the cave's flooded passageways riveted people worldwide. Highlighting the dangers, a former Thai navy SEAL volunteering to work on the rescue died Friday while replenishing oxygen canisters placed along the escape route. Chiang Rai province acting Gov. Narongsak Osatanakorn, who oversaw the rescue operation, said the boys should not be blamed for their near tragedy. He lauded the cooperation between Thai and international rescuers. Thongchai Lertwilairatanapong, a public health inspector, said the boys lost an average of 2 kilograms (4.4 pounds) while they were trapped. Before their discovery, they survived by drinking water dripping into their cramped refuge.